The Service Users and Family Support Group after its formation in 2014 is gradually becoming a formidable force. The purpose of this group is to be a voice that speaks for itself in advocacy for better medical facilities, medication, social inclusion and respect for the dignity and human right of people with mental disability. 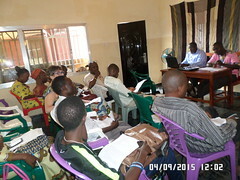 The group held its last Fridays’ meetings in Feb, March and April consecutively. 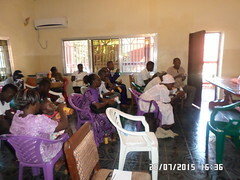 In February, the main focus at the meeting was to provide a professional stress management session for all attendees. The intended outcome was to help members (which includes users of services, providers and family members to be able to manage the stress that society poses in everyday life – either as a result of their condition or other external courses. Thanks to Rodney Allen-Campbell for offering us his expertise for no cost. The month of March was designed to be an experience sharing session. The ultimate purpose of this activity as was better explained by a psychiatric nurse (Miep – working at the Jui Mental Health Unit) was to empower members to be bold enough to share with other colleagues their various varying experiences as Service Users or Family Members. This was then followed by a group split – Users and Family members. This platform provided both groups the opportunity to be able to share their unique experiences. Indeed this revolutionary effort of the Mental Health Coalition to create and empower the Service Users’ Group has by means of fact, served as a motivation for group members to overcome the challenges faced. 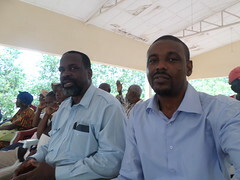 The outcome of the session done in March, 2015 has by means of feedback from group members to the general membership been one of healing and burden-relieved. Of course the session in April and its growing and outstanding effect cannot be over-emphasized. The team had a professional counsellor in the person of Mr. George Bindi who provided a general counselling session for the group. His emphasis was on looking at life from a different perspective; which can bring about the necessary great and positive change. The group invited members who were either service users or family members from other mental health services. They still continue to look forward for users who are willing to becoming members of this potentially strong advocacy entity. This great monthly meetings and sessions are held at the Enabling Access to Mental Health in Sierra Leone office at 5 Bass Street 3 Brookfields off King Harman Road. For more details feel free to reach members/organizers on telephone numbers +232-(0) 78-982 554 or +232-(0) 78 692 269. Remember “He Who Feels It, Knows it Better and Can Therefore Represent Themselves Better”…. because “There Is No Health Without Mental Health”! Long Live The Mental Health Coalition – Sierra Leone! Long Live The Service Users’ Group!